Today I’m going to share top 10 Fiverr alternatives and Fiverr clones, but before moving to the list of Fiverr alternatives and clones, lets know something about Fiverr. Fiverr, launched on 2010, is the world’s largest marketplace for micro jobs like article writing, SEO services, logo designing etc… Each and every gig at Fiverr starts at $5; you can charge more using Fiverr Extras onece you reach level 1. Fiverr currently hosts more than 3 Million Gigs (according to Wikipedia). You can sell anything from Designing services to Voice Over services on Fiverr. Whether you can suggest creative names for new products or you can create art with food items, whether you can do stunts with your Bike or you can create a funny video, Fiverr is your place. Everyone can make money with Fiverr and “You Need Money To Make Money” doesn’t apply to Fiverr, because you can make money on Fiverr without investing anything (I’m assuming you already have a Personal Computer and an Internet Connection). Those were some good things about Fiverr but not everything is perfect and the same applies to Fiverr. Fiverr has some limitations which have given rise to various websites like Fiverr. You can’t sell anything in Fiverr for more than $5. You must sell your services for $5 no matter how good or how bad your service or product is. You can add some extras in your Gig and can charge even more but you must make 10 sales in one month and must have positive rating. Some Fiverr clones like SEOClerks allow you to charge as much as you want. If you are a seller at Fiverr you may already know about this. A buyer must pay $5 to order a gig but the seller only gets $4. $1 is taken by Fiverr as a commission (You, however, should understand that Fiverr needs money to pay its staff and pay for their servers and this is the only source of their income). Most Fiverr alternatives don’t take anything as commission, they earn though ads instead. You listed a gig, someone ordered your gig, you delivered your service, your order is marked as complete by buyer and money was already sent to Fiverr but it’s not over yet; you’d still not get your money, you must wait for 2 weeks before your Fiverr account is credited with the money you made by selling your gig. Fiverr does this to protect their buyers and they give buyers enough time to file a Paypal dispute if the buyers didn’t get what they expected. Note: I’ve used estimated page views, total orders, Alexa rank, user reviews and Google page rank as a criteria rank these Fiverr Alternatives and Clones. SEOClerks is the best Fiverr alternative that I’ve seen around. It was started as a Fiverr clone but today it has turned into one of the biggest competitors of Fiverr and when you’d look their site today you’d not think that it’s a Fiverr clone. The quick support and the great features of SEOClerks make it stand out of the Fiverr clones crowd. Owners of SEOClerks have tried their best to make their marketplace popular and they are giving $5 SEOClerks credit for free to all new SEOClerks users. SEOClerks lets its sellers use WYSIWYG editor to make their services page stand out of the crowd. They have a discussion forum where you can chat with other sellers and buyers and can report scammers. Unlike Fiverr, SEOClerks accepts payment by Credit/Debit card, by PayPal, by Payza, by SolidTrustPay and they also accept Bitcoin payment. SEOClerks is a marketplace mainly for SEO services but you can sell other things like Articles, Themes, eBooks etc… It has a “Want To Buy” section similar to Fiverr’s “Buyer Requests” where you can request services that are not already being sold on there. Another great section of SEOClerks is the “Want To Trade” section where you can request trade of services or goods. GigBucks is another popular Fiverr Clone and its design is completely copied from Fiverr’s old version. GigBucks lets its sellers charge anything between $5 and $50 for their gigs. You can join it for free and can post as many Gigs as you want. Sellers can choose between PayPal, Payza or AlertPay as the payment method. GigBucks has a huge seller traffic and very less buyers traffic. Also some users had reported that GigBucks is a scam and GigBucks is not paying them. The owner tells that their PayPal account has been frozen but I don’t know who is correct, so you better check GigBuck reviews before using them. I’ll also post a GigBucks review soon. Fourerr is another site like Fiverr with different design but similar concept. Earlier, Fourerr didn’t allow sellers to sell their gigs for more than $4 but this limit was removed on June 19, 2014 and sellers can charge up to $25 for their gigs. Fourerr only pays through Paypal and it takes a part of the money earned by you as commission. I’ve read numerous Fourerr reviews and it seems to be legit so far. TenBux has completely copied the old Fiverr interface and has changed nothing other than the gig prices. Everything is similar to old Fiverr, the only difference is that you can charge $5, $10, $15 or $20 for your Gig. TenBux is still worth a shot as it gets good traffic. Be sure to read TenBux reviews before using it. TenBux takes 20% of your total earnings as a commission. Zeerk is made with WordPress platform and its design is slightly different from Fiverr V1. 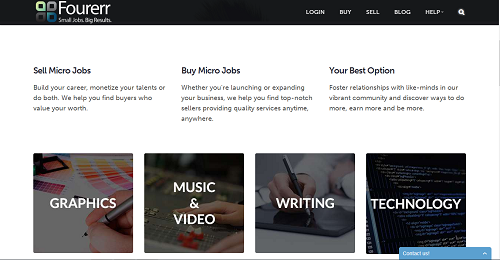 Zeerk lets its sellers list their gigs for $2, $5, $10, $15, $25, $50, $75, $100. As far as I know, Zeerk doesn’t take anything as commission. 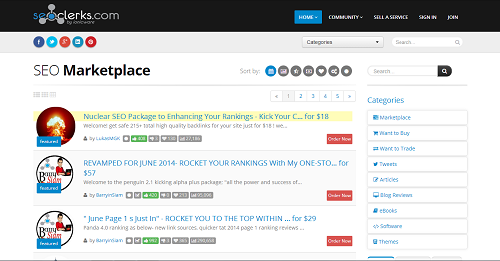 Tenrr is another site like Fiverr and the owner has done some modifications to the default theme. The name, Tenrr, is blatantly copied from Fiverr though. Tenrr lets its users sell gigs for $1, $2, $3, $4, $5, $6, $7, $8, $9 and $10 and commission rate is much lower than Fiverr. It has a blog too but the blog has not been updated since April, 2013. FiverUp is powered by FiverrScript Fiverr clone script. FiverUp’s design is a bit similar to the Fiverr V2, it’s not completely copied though. Unlike Fiverr, FiverUp lets you push your Gig to top by simply clicking a link. They also promote the gigs posted on their site by posting them on their Facebook page and Twitter handle. You can sell gigs for $4, $5, $10, $15, $20, $25, $50 and $100. GigsBull is also made using a Fiverr clone script. You can sell your gigs for $3, $5, $6, $9, $12, $15, $18, $21, $24, $27, $30, $45, $54, $60, $72, $84, $90 and $100 on GigsBull. ZJobs is a Fiverr alternative with different design. ZJobs lets its sellers sell gigs for $0.01, $1, $2, $3, $4, $5, $6, $7, $8, $9, $10, $15, $20, $25, $30, $40, $50, $60, $70, $80, $90 and $100. Gofer is another site like Fiverr which looks like a complete duplicate of Fiverr V1. You can not charge anything more or less than $25 on Gofer. That’s all for now. I hope these Fiverr clones and alternatives help you. I’m not telling you to leave Fiverr just top use its clones and alternatives, you can use all of them at the same time. Also, I want to let you know, if you are planning to launch a Fiverr clone site, that most of the Fiverr clones end up being sold on Flippa and being closed ultimately. Feel free to suggest more sites like Fiverr using the comment box below. This entry was posted in Make Money, Reviews and tagged Fiverr by admin. Bookmark the permalink. Didn’t know about Zeepal, thanks for letting me know. I’ll try to review Zeepal once I get sufficient information about it. Hello! Thank you for including Fourerr on your list of top Fiverr alternatives. We are truly honoured! Also, we want to give you guys a heads up on the new Fourerr! Yes, we’ve got a lot bigger and better! First, Sellers can now earn more and sell up to $700! On top of that, we just launched our new Reward System, where both buyers and sellers can earn reward through buying, selling, and even from merely interacting with us! We would love it if you can spread the word again. Let us know if you’ll need more info and we will gladly send it. Regards! I have found this site officerr.com. Looks nice, easy to use. Can sell services from $1 to $100. Thanks. I will add it after doing some research.